This month, thousands of college graduates are walking across the stage to shake hands, smile for the camera, and pick up their diplomas. 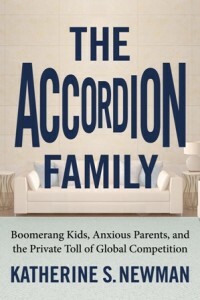 Many of those newly minted American college graduates are moving out of their dorm rooms and back into their childhood bedrooms, according to Johns Hopkins University sociologist Katherine Newman, author of The Accordion Family: Boomerang Kids, Anxious Parents, and the Private Toll of Global Competition (Beacon Press, January 2012). The current economic climate didn’t cause this moving-home trend, which Newman says began to emerge in the 1980s when the entry level job market for young people began to develop rough patches. The recession is exacerbating the need for college grads to shelter the cost of living at the Inn of Mom and Dad. Image courtesy of Beacon Press. Newman says that consolidating households can be a very smart move, benefitting not just budget-conscious young adults but their parents, too. After interviewing many families, she found that the while baby boomer parents would have avoided the same move in their youth, they are welcoming their so-called “boomerang kids” with open arms. Having worked through their children’s childhood years, they were not tired of them at age 18 and refilling the empty nest has a way of making people feel young – because they are not moving on in the life cycle themselves. Instead, they are active parents once again, enjoying the pleasant parts of parenting without the difficult aspects inherent in supervising teenagers. But what’s good for families isn’t necessarily good for the economy as a whole. At the national level, the mass homeward migration could bring about negative economic consequences, Newman says. As a generation of young adults delays starting new families, she predicts that population growth will fizzle and economic gains will stall, based on her case studies of how the trend is playing out in Italy, Spain and Japan. Social security becomes harder to pay for when birth rates decline and productivity is rarely enhanced when a society ages, as it has in Japan.